“[Martin Luther King Jr.] was always committed to interfaith dialogue, toward the cause of building coalitions toward truth and justice for all of God’s people,” said the Rev. Jonathan L. Walton (left). S. Allen Counter (right), director of the Harvard Foundation, said the event “was an opportunity to teach the younger community about the Civil Rights Movement, and what whites, blacks, and Latinos accomplished together." Transcendent songs of struggle and freedom filled the vast sanctuary at Harvard’s Memorial Church Monday night as part of a celebration of the life and message of Martin Luther King Jr. The event marked the start of the University’s third annual Interfaith Awareness Week. The event brought a screening of the documentary film “Soundtrack for a Revolution” to a generation of students who were born long after King’s assassination in 1968. 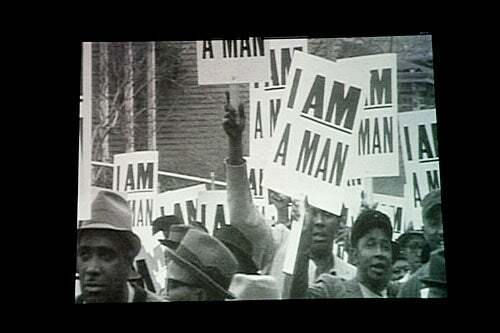 The film contains a condensed history of the Civil Rights Movement with modern musical interludes by John Legend, Wyclef Jean, The Roots, and others. “With the added musical dimension, it was an opportunity to teach the younger community about the Civil Rights Movement, and what whites, blacks, and Latinos accomplished together,” said S. Allen Counter, director of the Harvard Foundation for Intercultural and Race Relations, one of the event planners. This was the first year that commemorations of King’s life have coincided with Interfaith Week. As part of Interfaith Awareness Week events at Harvard, the documentary “Soundtrack for a Revolution” was shown at the Memorial Church. Inspired by World Interfaith Harmony Week, a United Nations resolution that designated early February as a time to reaffirm that “mutual understanding and interreligious dialogue constitute important dimensions of a culture of peace,” members of the Harvard community each year host events aimed at nurturing and celebrating a climate of religious pluralism on campus. Faith is one of the most important aspects of our lives, Mehta added, and perhaps nowhere is this more evident than in the nonviolent struggle for civil rights, a movement rich in belief and faith-based music. As the film follows King from Montgomery to Selma to Birmingham, touching on the critical moments in the struggle for civil rights, it becomes clear that the musical tradition that came out of the black church held the movement together through some of its bleakest hours. African-American spirituals such as “Eyes on the Prize,” “We Shall Not be Moved,” and “We Shall Overcome” became freedom songs that now symbolize justice through nonviolent action. “It was the music that gave us the courage, the will, the drive to go on, despite it all,” U.S. Representative John Lewis said in the film. A prominent student movement leader at the time, Lewis faced violence and arrest many times. “Even after we were thrown in jail, someone would sing a song,” he remembered. Part of the mission of Interfaith Week is to keep inclusive dialogue relevant on campus and throughout the larger community. On campuses, Mehta said, students are often challenged to answer questions about their faith. Co-sponsors of this year’s events include the Harvard College Interfaith Council, the Harvard Chaplains, the Center for the Study of World Religions at Harvard Divinity School, and the Pluralism Project. Due to an impending snowstorm, Friday’s Interfaith Awareness Week event, “Remembering Swami Vivekananda at 150,” has been postponed until March. For additional listings of upcoming events, visit the website. “Reporting is not happening now. Everybody’s afraid,” said Ferai Tinç, who after 28 years left her position as foreign news editor and columnist for the daily Hürriyet, one of Turkey's major newspapers, in July 2011.